DJH Communications Ltd are incredibly pleased to announce that they are the winners of the “Best Office & Business Phone System Provider 2018 in North Wales” and the “Mobile Communications Specialist of the Year 2018 in North Wales”, having also won the Wealth and Finance 2017 Business Award for Best Mobile Communications Specialist in North Wales last year. Respected members of various industries in the area cast their votes alongside awards officials to determine the winner of each category. The decision process is taken very seriously, with the achievements, commitments, and methods of each company being scrutinised over the past 12 months. To be shortlisted was an amazing achievement itself, but to win the award is something that DJH Communications will display proudly. Based in North Wales, our team provide only the highest quality mobile communication, vehicle fleet tracking, mobile broadband, business mobile, and fixed line services. Your needs will be met with over 20 years of experience dealing with some of the UK’s biggest communication businesses. Our knowledge and expertise have become invaluable to the many local businesses in the area that have a need for effective communication requirements. The current fast-paced global market has made it difficult for the local businessman to achieve great success, with various advancements in technology and competition at an all-time high. Despite these difficulties, a lot of local firms are still striving to achieve great things, with companies like our own providing the highest standards of knowledge and customer service, and being recognised by other businesses and such a valued awards team for what we do is an achievement that DJH Communications is incredibly proud of. 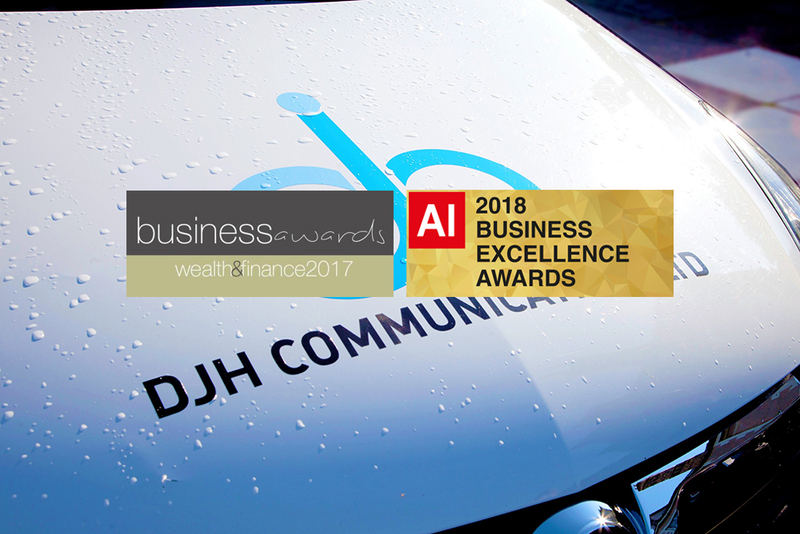 We thank everyone at the AI 2018 Business Excellence Awards and the Wealth and Finance Business Awards for organising the awards and delivering us with the good news, and the officials, as well as the judges and local businesses that recognised the hard work and dedication of DJH Communications by casting their vote. We are proud to now display both awards on our website and look forward to the many benefits it will bring in the near future.